Gluten Free Italian: Simple and Delicious Recipes for Cooking Italian Cuisine, is today’s free Kindle download. Written by Sarah Sophia, who has also written cookbooks on hot sauces, smoothies, and gluten-free baking. If you have gluten free friends or if you’re looking to cut down on wheat-based carbohydrates, gluten free recipes from Sarah’s book will be very helpful. So many of your favorite foods are off limits and if you’re like me and you love Italian food, this can be a pain. This book is perfect for your gluten-free lifestyle… lots and lots of delicious, Italian recipes so that you can enjoy your favorite foods without feeling guilty. You may be gluten intolerant or you may choose to avoid gluten for health benefits (of which there are many) but sometimes you just need a flavorful, hearty home cooked Italian meal! Craving a pasta or pizza tonight? I’ve got you covered with a whole host of simple recipes to follow. The recipes in this book let you eat your favorite Italian dishes without affecting your body, health or diet efforts! 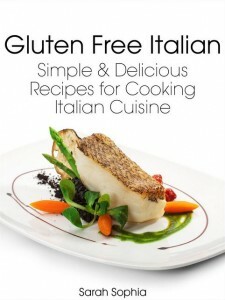 Inside you will find quick and easy recipes for cooking delicious gluten-free Italian cuisine that will blow you away. But that’s not all… we all need something sweet in our lives so I decided to give you a bunch of gluten-free recipes for desserts. Now you can satisfy that sweet tooth 100% guilt free. Gluten Free Italian: Simple and Delicious Recipes for Cooking Italian Cuisine is available as a free Kindle download from Amazon on Tuesday, March 18, 2014. As of this writing, the book has 4.6 out of 5 stars from 9 Amazon reviewers. For more free eBooks, check out our 10 Websites to Download Free eBooks list, as well as our Free eBook of the Day archive.